Along with two of my friends, I arrived at the Male airport on November 18, 2015. A representative from the Soneva Fushi resort welcomed us with a warm smile. We were led to a luxurious waiting room and offered fresh fruit smoothies and complimentary massages while we waited for our luggage to be transported onto the sea plane that would fly us to the resort. My best friend Nicole Scherzinger, a world class singer and television personality, had been invited to the Soneva Resort to celebrate their 20 Year Anniversary. She asked her sister and I to accompany her. Little did we know, we were about to enter a paradise unlike any we had ever encountered. 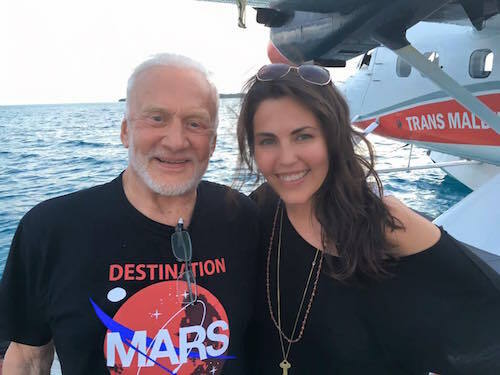 On the short sea plane ride over to the private island, Buzz Aldrin, Astronaut extraordinaire, and his family were also on board. Nicole and Buzz are old friends from their days performing on the US version of “Dancing with the Stars.” Buzz raved about the Soneva Fushi and told us he had been visiting the resort for years. We all giggled and spoke in animated voices about the adventures that awaited us once we arrived on the island. As I looked out of the windows of the sea plane I audibly gasped while looking at the scenery below. I had never before seen waters this particular shade of turquoise blue. The color was mesmerizing. Buzz mentioned he would be giving a short talk about his Moon landing at the resort’s observatory to all of the invited guests. The next evening when I peered through the lens of a telescope and studied the moon, Buzz gave a detailed explanation of the beauty I was beholding. I could not believe I was “moon gazing” with Buzz Aldrin. It was one of those surreal moments in life where you have to pinch yourself to make sure you aren’t dreaming. Once at the resort, we were welcomed by a gregarious staff that immediately made us feel more like family than guests. The girls and I were introduced to Aravind who would be our guide and often companion on this incredible adventure. He showed us the way to our sea side villa where we would be staying for the next five days. 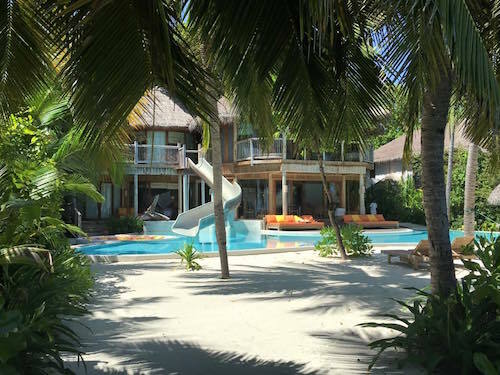 The villa was a 4 bedroom masterpiece that included an enormous water slide, a salt water pool overlooking the crystal blue ocean, a fully equipped gym, and breath taking outdoor bathrooms. In the very middle of the villa was the most majestic tree I have ever seen. It was the perfect centerpiece to this eco-friendly haven. We spent much of our time swimming, snorkeling, paddle boarding, relaxing in the sun, and taking turns on the water slide. When we were hungry we feasted on succulent shrimp, pan seared tuna, vegetarian pastas, and an array of delectable chocolates. 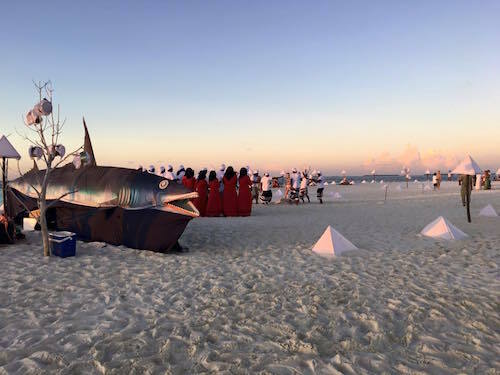 Other activities during 5 days in paradise included a sunset dolphin cruise, a cooking class by a master chef, tai chi and yoga classes, and sunset cocktails on a private sandbank. The culmination of our stay was a culinary extravaganza through the jungle. Tantalizing food from around the world was offered in abundance. The night concluded with dancing at the Mihiree Mitha Restaurant. 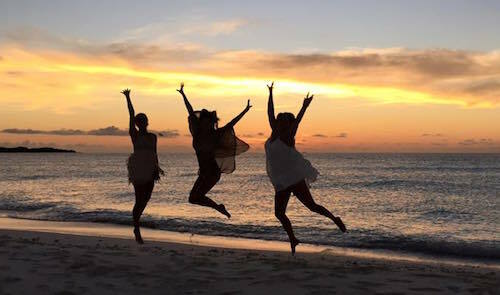 When it came time to leave the magical island resort, my friends and I lingered for as long as possible trying to etch every moment of our adventure into our hearts. It was trip of a lifetime and one I will never forget. I highly recommend the Soneva Fushi resort to all who are seeking their own dream holiday in a gorgeous, tropical wonderland. 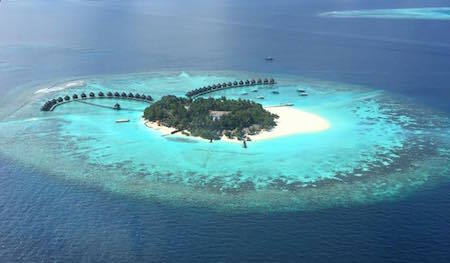 Visit Soneva Fushi for a small glimpse of the beauty this gorgeous private island has to offer.